The National Basketball Association (NBA) has had many great players throughout the years. A few have made a great impact on the game and are truly outstanding. Of course, any list is truly subjective and some people may disagree with my opinion on who were the all-time players. From examining what they did in their careers, as well as their attitudes toward playing the game, you can learn some important lessons. Note: Since this was written, there have been a number of new great players. I'll be updating the list soon, along with your suggestions. Who were the greatest centers? Who were the greatest guards ? Who were the greatest forwards? Bill Russell was a supreme defensive player and team leader of the Boston Celtics. He didn't seem to be as skilled as someone like Wilt Chamberlain, but during his career the Celtics won 11 NBA championships in his 13 years of playing. Several seasons he averaged over 25 rebounds a game and was a true winner. Wilt Chamberlain was the most physical imposing and athletic of all centers. One season he averaged 50 points and 25 rebounds a game. Of course, he is also famous for scoring 100 points in a single game. When he went to the foul line to shoot a free-throw in high school, he would stand at the top of the key, throw the ball up, take two steps, jump and jam the ball through. The rule that a player cannot cross the plane of the free-throw line was later imposed. At the University of Kansas, Chamberlain was also a track star, running the 440 yard race and competing in the high jump. That shows tremendous athleticism and coordination for a person 7 foot 2 inches in height. When playing in the pros, Chamberlain was rated as the strongest man in professional sports. There was talk at one time of him going into boxing to take on Mohammad Ali, but I think that was all talk. With all his skills, he often used a disappointing finger-roll shot instead of jamming the ball through the net, as shown below. A problem with having Chamberlain on a team was that he was such a scoring machine that other other players started to just stand around. "Give the ball to Wilt and watch him score," resulted in underachieving teams. It wasn't until he got to the L.A. Lakers where Coach Bill Sharman changed Wilt into more of a defensive play, that he truly reached his prime. Ervin "Magic" Johnson said he was "the stick that stirred the drink." Although he was capable of being the go-to guy on the team, he preferred to orchestrate the play and was among the league-leaders in assists each year. At 6' 9", he was the tallest guard to ever play in the NBA. Johnson would often get "triple doubles" in games: over 10 points, assists and rebounds. Michael Jordan has been called the greatest basketball player ever. The 6' 6" shooting guard had tremendous jumping ability, allowing him to make fantastic dunks over his opponents. He was extremely quick, such that he was a defensive leader in steals. When his jumping ability diminished later in his career, Jordan developed a fad-away jump shot that was accurate and impossible to block. In his second year with the Chicago Bulls, he broke his foot. The Bulls wanted to keep him out for the whole season, so they could get a higher choice in the draft. But Jordan would have none of that. When his injury healed, he finished out the season playing and trying to help the team win a playoff spot. He scored 63 points in the first round of the playoffs against the Boston Celtics. He was a true competitor. When Jordan left the Bulls to make a try at professional baseball, the team floundered. As soon as he returned, they won the NBA championship again. 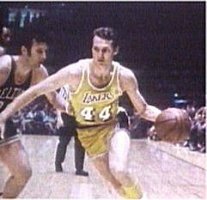 Jerry West was a 6' 4" guard for the Los Angeles Lakers. He was known as "Mr. Clutch" because he would especially excel during crunch-time in a game. A clever defensive move West had was to let an opponent dribble by him and then steal the ball from behind, when the player went up for a jump shot. Stockton's ability to find an open player made him one of the greatest assist men of all times. Larry Bird brought Indiana State University to the national finals and was ranked as one of the great college players. But they did not expect the 6' 9" forward to excel in the pros because his arms were too short and he was not much of a jumper. Bird proved his critics wrong with his great work-ethic and shooting ability. He even won the NBA All-Star game 3-point shooting contest. Julius "Dr. J" Erving was a prolific scorer and almost unstoppable when driving the line and making acrobatic dunks. He originally starred with the ABA New Jersey Nets and stayed with the team when they joined the NBA. To bolster their chances for a championship, the Nets hired Nat Archibald as their point guard, but they made the stupid mistake of paying Archibald more than their most valuable player, Dr. J. He became unhappy and left the team to join the Philadelphia 76ers, where he spent the remainder of his illustrious career. The all-time greatest players in the NBA had not only the physical abilities, but they also possessed the drive and competitive spirit to make them the best.